Trained as a registered nurse, Cr McIntosh worked as a real estate and owned a range of tourism, hospitality and health support venues before being elected to the City of Ballarat's local council in 2008. Starting her first marketing agency in 2000, Angie Bradbury has scaled heady heights to become a leading authority in strategic marketing and communications, today she runs the uber-successful Dig & Fish. My own ambitions have been distinctly shaped by mum’s life experiences – she has taught me humility, empathy and courage – but above all else, she has taught me to ‘never give up’. 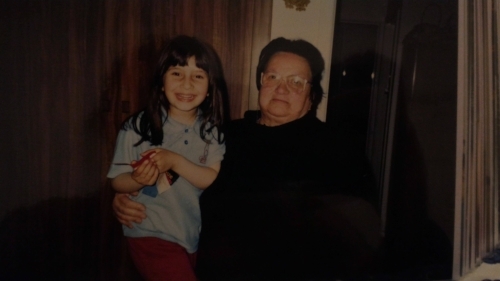 Like many Italian women my grandmother was a fantastic seamstress and an amazing cook but more importantly she was kind, smart, incredibly courageous and has made me incredibly proud to be her only granddaughter. Rifling through my mum’s cherished ‘family history’ box, I stumbled on a tattered newspaper article. A photo of a very purposeful woman struck me; neat collar and socking, files in hand, striding… somewhere. So we have a new government (just) – Turnbull has been returned with a single seat majority. With so many competing ideologies, the next three years will undoubtedly tough, complex for both for those who make up the 45th Parliament and for those representing the many of issues requiring government involvement. A major indication of government recognition was achieved this month for Collective Position client, Regional Capitals Australia (RCA), when the alliance of regional city local governments addressed a Senate Committee investigating the growing needs of the nation’s 50 regional capitals. Regional Capitals Australia played an active part in lobbying for the Federal Senate Inquiry, which was announced earlier this year, with a series of public hearings beginning in Geelong on August 21. Collective Position Director Rachael Sweeney says the Senate Committee is trying to uncover the ‘significant role and contribution of regional capitals to Australia’, and the Inquiry marks an unprecedented level of focus on regional capitals at a Federal level. “Having this Inquiry passed by the Senate is a major milestone for regional capitals; it has provided a platform for these important cities to demonstrate their true value and contribution to the social and economic wellbeing of regional Australia, and Australia as a whole,” says Sweeney. Collective Position provides strategy, advocacy, communications and secretariat services to RCA. This work involves leading delegations to Canberra to meet with relevant politicians and stakeholders, developing policy documents and a strategic plan through close work with RCA’s membership of local government Mayors and CEOs. Collective Position facilitated a strategic planning day in May, bringing together the RCA Board to collaborate on a redefined vision for the the alliance since it was established three year ago, and identifying crucial policy areas that RCA will lobby for in the 12 months leading up to the federal election. At the Senate Inquiry, RCA Chair and Mackay Regional Council Mayor, Cr Deirdre Comerford told the Senate inquiry regional capitals jointly generate $225 billion per annum, or more than 15 per cent of national economic activity, yet there is no consistent national policy dedicated to lift the productivity and liveability of regional capitals. Delivering the opening set of evidence at the first round of public hearings, Mayor Comerford called for additional Federal funding to grow Australia’s 50 regional capitals. "The time for a rethink is now. RCA has made a clear call to action – our national leaders must take a good look at the potential that sits outside the urban growth boundaries of our capital cities – and commit to sustainably growing our regional capitals. Further hearings are being held in Geraldton, WA and Launceston, Tasmania, with a report expected from the Senate by December 2015. Collective Position is also working with RCA to develop a Positions Paper that will serve as a key engagement tool between federal policy makers in the lead up to the next election, likely to be in mid 2016. A Collective Position government relations campaign for Wine Victoria has been recognised in the Public Relations Institute of Australia (PRIA) Golden Target Awards. Uncorking Victoria’s Potential received a Commended award in the Public Affairs category for its notable advocacy outcomes achieved for a struggling Victorian wine industry. Collective Position was engaged by the industry in 2013 when Wine Victoria emerged as the industry’s new peak body after facing significant issues of unprofitability, declining government funding and an unsupportive membership. The new association needed Collective Position’s stakeholder engagement expertise to ‘revamp’ its strategic direction, reputation and stakeholder relationships. The collapse of the industry’s peak body two years earlier had caused the Victorian Government to lose interest in working with divided stakeholders, while relationships and funding support had evaporated. “Winemakers had been left with no shared voice and funding,” says Collective Position Director Rachael Sweeney. Tasked with rallying support from 21 dispirited wine regions for shared industry policy positions, Collective Position designed a membership engagement strategy and 18-month pre-election government relations campaign to win simultaneous government support. Collective Position understood that increasing exports and tourism were seen as fundamental to Victoria’s economic success. Research showed that these issues were also key to a profitable future for the wine industry. Collective Position set to work highlighting the growth potential of ‘wine’ in the export and tourism space, ensuring stakeholders understood that a profitable wine industry meant an economically strong Victoria. Other areas of industry concern were identified to enable a full suite of industry issues representation. By November 2014, support from both the Victorian Government and Opposition had proven that the voice and value of the wine industry had finally been recognised. Commitments had been made in the two key areas of tourism and trade, and additional commitments had been made by the winning Party – Victorian Labor - to include Wine Victoria in policy design and delivery. Collective Position took the industry from no support or recognition to industry-specific funding and a seat at the policy table. This has enabled the industry to take its first big steps in returning the industry to a profitable and globally competitive state. Wine Victoria Chair, Damien Sheehan, has welcomed four new members to the Wine Victoria Board. The Hon. Patrick McNamara, Dr Richard McIntyre, Ms Angie Bradbury and Mr Roger Sharp will join the Board effective immediately. Mr Sheehan said the Victorian wine industry was fortunate to be guided by such highly regarded professionals. "Our new members are well respected experts in their respective fields and bring to the Board a wealth of experience and expertise across the areas of government relations and politics, tourism, industry communications, winemaking and viticulture." The Hon Patrick McNamara was a member of the Victorian Legislative Assembly from 1982 to 2000, and Deputy Premier from 1992 to 1999. Since leaving politics Mr McNamara has held a number of key positions including Chair of the Victorian Bushfire Appeal Fund and Trustee of the MCG Trust. Dr Richard McIntyre is the co-owner and winemaker at Moorooduc Estate on the Mornington Peninsula. A trained surgeon, Mr McIntyre started his career in medicine, but on return to Australia in the 1980's turned his hand to winemaking. Mr McIntyre is one of the pioneers of the wild yeast fermentation style of winemaking in Australia and was a finalist in the Gourmet Traveller Winemaker of the Year Awards in 2008. Ms Angie Bradbury is the founder of Dig + Fish and a well-respected industry leader in marketing and communications strategies for the food, drinks and leisure industries. Ms Bradbury currently chairs Wine Communicators of Australia, and is a member of the Victorian Food and Wine Tourism Council. Roger Sharp is the Director of Global Corporate Affairs for Treasury Wine Estates and is a communications and public affairs specialist with broad experience across media relations, corporate social responsibility and government relations. Mr Sharp also sits on the Board of Directors for Wine Communicators of Australia. Mr Sheehan said that the new members join an already impressive group of people on the Wine Victoria Board, including Dr John Stocker, Mr James Omond, Mr Ross Wilson and Mr Ross Brown. "We are very excited to move into the second half of 2014, and what promises to be a busy six months for Wine Victoria. "Ensuring that we can assist the wine industry to turn the tide on our profitability issues will be our key focus. "As the state moves closer to the election, the new Board will be focused on ensuring our future political leaders are well briefed on the issues of trade and export, regional tourism, and wine and health. Rachael Sweeney, Director, Collective Position was appointed to the Public Relations Institute of Australia (PRIA) - Victoria Council this week. The PRIA is the representative body for public relations and communication professionals in Australia. Established in 1949, the PRIA adheres to and encourages the highest standards of ethical practice from it's members while representing public relations practitioners in the best interests of the profession. Rachael is excited about the opportunity to bring her experience and expertise to the Council, as well as to give back to the industry she loves by working with the PRIA.